NMS-873 is an allosteric and specific p97 inhibitor with IC50 of 30 nM that demonstrates potent selectivity for VCP/p97 compared to a panel of other AAA ATPases, Hsp90, and 53 additional analyzed kinases (IC50s >10 μM). (E) The mDPC level induced by HN2 in the presence of MG132 or NMS-873. 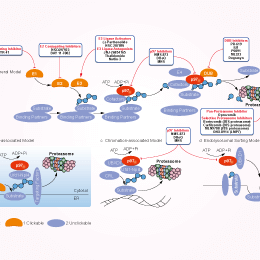 MG132 or NMS-873 were added for 3 h after HN2 exposure and then replaced by normal medium until 24 h.
DBeQ is a selective, potent, reversible, and ATP-competitive p97 inhibitor with IC50 of 1.5 μM. MNS is a tyrosine kinase inhibitor, inhibits Syk, Src, p97 with IC50 of 2.5 μM, 29.3 μM and 1.7 μM, respectively. WT mouse primary macrophages were untreated as control (lane 1) or treated with 0.1μg/ml E. coli LPS (lane 5-8), 10μM E-64 (lane 2 and 6), 250μM PMSF (lane 3 and 7), or 20μM MNS (lane 4 and 8). The cells were continuously cultured for 16 hrs. Extracts from whole cells or nuclei were separately purified and subjected to WB analysis with antibody against pERK2, LITAF, or actin/tubulin as control.